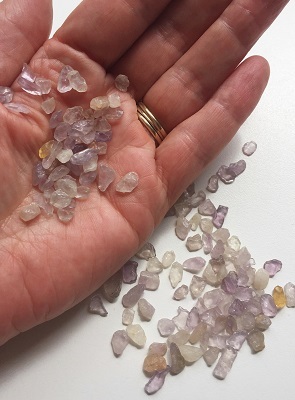 Beautiful lavender and citrine colored smaller sized Amethyst tumbled stones from Brazil. 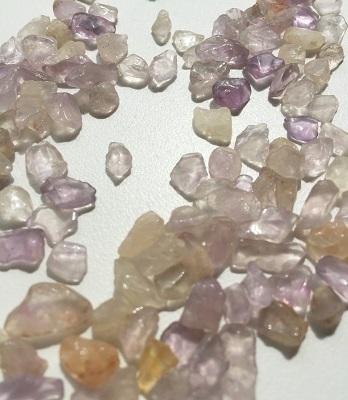 Beautiful lavender and citrine colored smaller sized Amethyst tumbled stones from Brazil. 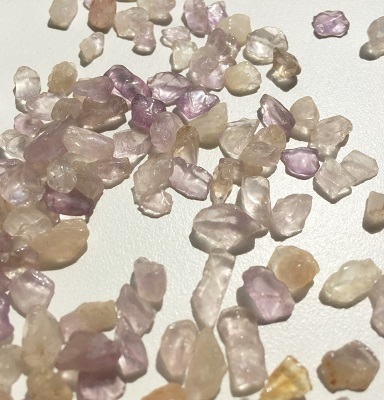 These Amethyst tumbled stones are the perfect size for medicine bags, smaller crystal grids, crystal intention gardens, or orgone generators. Amethyst is an extremely powerful and protective stone. It is also a stone of meditation. It enhances spiritual awareness and stimulates the mind, psychic abilities, and one’s connection to the spiritual realms. Amethyst allows one to gain a deeper understanding of the root cause of life experiences, which in turn, facilitates the ability to overcome addictions and blockages of all kinds. Amethyst assists in eliminating emotion-based decision-making allowing one to take actions based on higher guidance and spiritual understanding. Amethyst provides clarity and assists one in identifying damaging beliefs, behaviors, and habits that have created an energetic imbalance in the physical realm. Amethyst enhances memory and improves motivation, being able to set realistic goal. Balances highs and lows and dispels anger, fear, and anxiety. In healing, Amethyst helps balance the nervous system and the brain. Amethyst boosts production of hormones, and tunes the endocrine system and metabolism. It strengthens the cleansing and eliminating organs and the immune system. It relieves physical, emotional, and psychological pain or stress. It eases headaches and releases tension. It also reduces bruising, injuries, swelling, and hearing disorders. Amethyst is supportive of healthy lungs, respiratory tract, skin conditions, cellular disorders, and the digestive tract. Treats insomnia and brings restful sleep.